The rabbit had disappeared when Jill and the kids got home. They searched for a while and then remembered that I'd said I thought it had been trying to get into the base of our bed - sure enough, when they looked underneath, there was a rabbit sized bulge! After a lot of calling, they managed to get the bunny to come out. I'm still struggling with the Pirate story, though I think my efforts may actually be paying off. There was one girl figure I struggled with for ages, then I called Jill in to model for me - which made all the difference! I know why the pros use models - it really is all the reference you need. The same goes for drawing buildings, cars, ships, etc. I don't quite know why I'm always trying to build things from scratch on paper, when the real world is available as perfect reference material in most cases. That said, I'm trying to envisage Moth's father's house for Moth & Tanuki, Part 4, but I'll need Jill's help to do a floorplan, I think (she designs great houses). 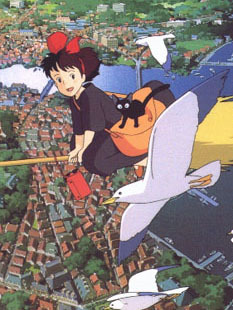 Oh yeah, as reported here, Hollywood is going to remake Kiki's Delivery Service as a live-action film, even though Miyazaki's animated version is regarded as an all-time classic in every respect. To me, this is horrible news! Here I was scared of them making a lousy film of one of my favourite novels, Life of Pi, and this is far worse! Apart from anything else, it is cultural appropriation, but worse, it will be utterly Americanised. What is wrong with them, that they can't enjoy the original?! While I'm on it - I had the misfortune to import a US DVD of Kiki's Delivery Service, and it had a horrible introduction from John Lassiter of Pixar which gave away all the major surprises and plot-points and it was set so you couldn't skip it! Couldn't Americans watch it without having one of their own explain it?! I mean Lassiter's a talented guy, but this was pathetic! Thankyou, Madman Entertainment for the local release! The comic piece I'm currently working on for Tonia's Pirate anthology is coming along nicely. I feel a bit logjammed on other work, given that I have six pieces now awaiting publication in eight different anthologies. What I need is a title! I've come up with some pretty corny ideas so far! It's a traditional adventure/romance tale with a bad pirate captain, his heroic offsider and a beautiful girl. Any suggestions welcomed! I've been searching for appropriate music to play while working on this, and have fallen back on The Turn of a Friendly Card, and Tales of Mystery & Imagination, by The Alan Parsons Project, and Poe: More Tales of M&I, by Eric Woolfson (Parson's main songwriter). Somehow they have a kind of epic, nautical feel that is appropriate - ToaFC contains my favourite instrumental ever, "The Gold Bug," named after Poe's story about pirates! Tales, of course, contains "The Raven," based on Poe's classic poem. I hadn't thought much about the inspiration for this until the other day, when there was lots of banging on the metal roof and high window of the building I was working in. When I waited a while and watched, there was a large raven, tap, tap, tapping on the window, which he kept up for hours, until it was almost dark. I don't know if it was the bird's reflection that inspired this behaviour, though it seemed keen to pull out the lining around the window as well! It did make what Poe described - in his perfect iambic pentameter - only too clear though. On Saturday, we finally got a chance to look at the creek properly. Like a living animal, it had carved new paths for itself across the landscape, taking a lot of the banks on both sides, ripping out our metal sheeting as well as the neighbours' chickenwire, and widening considerably. Amongst the other debris were three huge lumps of trees, one of which was on top of the sewer pipe that crosses the creek to the easement on the other bank - which we're fortunately not connected to as yet :). While I was trying to chop one of these immense petrified lumps of wood with an axe (we're still in the Stone Age) the neighbours came down to survey the damage as well. Not long after, they returned with a chainsaw, and we spent the rest of the afternoon moving lumps of wood, rocks and stones, in an attempt to get the creek back on track and to try to add a bit to the (much reduced) banks. All in all, a pleasant surprise and maybe a sign that things between us are improving, which would be great! We took over a bottle of wine last night to say thanks. Drawing wise, not a lot is happening. I feel really tired and need to sleep a lot - which is unlike me - and I think it's an after-effect of the whooping cough. Work is tiring, as I'm helping to research and write up a particularly pedantic piece of policy and things are busying up again. I did give a halfway decent class last week though - if only I could guarantee being able to do that! I momentarily considered taking down my Lost Cockatiels page, but just received another email from someone who had lost their friend. It's funny, the pages I've put up about this and Acrylic Painting Tips receive more responses than anything else I do, and it's pleasing that they're useful. Last week's heat wave has passed and it rained yesterday, and rained, and rained. The roof is leaking around one of our skylights and the ceiling feels soggy. Overnight, I could hear the creek thundering away like never before (and it's gotten pretty big in the past). This morning when I looked out the kitchen window, I could see the creek, which I can't usually. When I went outside I could see the water stretching away across our neighbours' yard and forcing a new path for itself at the bottom of our garden. It was no longer a creek - it was a river! The width was amazing, but so was the depth, with trees in the middle standing up, many plants knocked over, lots of large logs and debris, and the bridges submerged. Looking across at the neighbours' place I could see their pots (usually on the next level up) sticking out of the water, and I figure their garden furniture must have been underwater or washed away - it looked like Isengard after the ents had visited! It's hard not to feel a small glimmer of satisfaction, given the intensive land-clearing, poisoning and clearing they've done in the garden, with scarcely a native plant or large tree left. There's hardly a weekend when they're not running a wood-chipper or spraying poison (many of the trees I've planted near the border have died as a result. Anyway, Jill rang to say that once the water had subsided all their meticulous creekbank work (stones and chicken-wire) was entirely washed away, as was much of their lower garden, and things were very eroded - which is pretty much what you'd expect once the trees were removed. The creek had evidently swept across our back lawn as well, leaving mud and silt, but pretty much everything else looking okay (plenty of plants to hold it all together). A film version of Yann Martel's sublime novel Life of Pi has been rumoured for some time, but is now confirmed as in production, directed by M. Night Shyamalan and written by Dean Georgais. I have real reservations, and this will no doubt be a movie that falls far short of the book, particularly given the ambiguous subtleties, changing perspectives and ultimate questions of faith that Martel has skillfully interwoven into the narrative. It's not a perfect book by any means, but that's beside the point. It's also derivative in its central premise, if not the ideas - as I've discussed elsewhere - of Moacyr Scliar's Max and the Cats, something Martel freely admits, but also beside the point of this wonderful book :). Probably I should write a proper review, beyond what the above picture tells about the book. I did write one a few years ago, but can't seem to find it. While I think of it, the story I've been researching and writing up as a potential children's comic serial, might well work better as a straight prose children's novel! Maybe it's a good thing I haven't done any detailed character design for it yet.